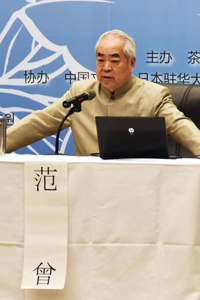 Since the year 2004, Urasenke has organized a yearly symposium on the Tea Culture of East Asia, coupled with a panel discussion on East Asia's Culture and Peace. 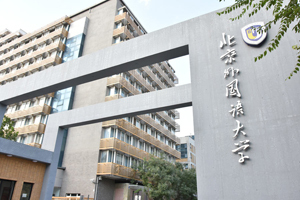 This significant project, meant to deepen mutual understanding between China, the Republic of Korea (ROK), and Japan through cultural and scholarly exchange and to thus contribute to realizing more amity and peace in East Asia, was begun per the initiative of Daisosho SEN Genshitsu. 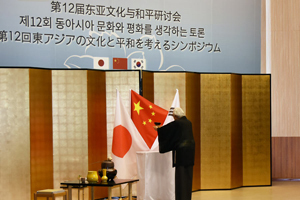 As the year 2017 was the 45th anniversary of the normalization of diplomatic relations between Japan and China as well as the 25th anniversary of that between China and the ROK, the dual program in 2017 was combined and named "12th Symposium to Consider East Asia's Culture and Peace," and it commemorated those anniversaries. 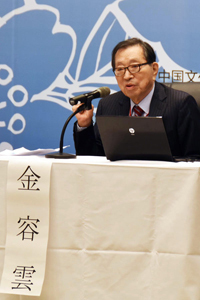 Like the previous programs, invited Chinese, ROK, and Japanese experts and researchers convened to introduce their findings and thoughts. 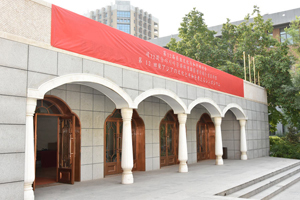 The program was held over the two days of September 21–22, with the Arabic Center at the Beijing Foreign Studies University (BFSU), China, as the main venue, and the sponsoring organizations being the Urasenke Tankokai Federation, the China-Japan Friendship Association, and BFSU. 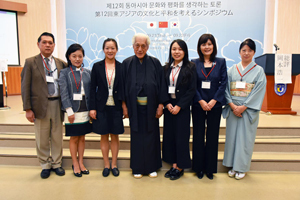 Altogether, approximately 450 people took part, including a large number of Urasenke chado followers from Japan and other parts of Asia, and BFSU teachers and students. 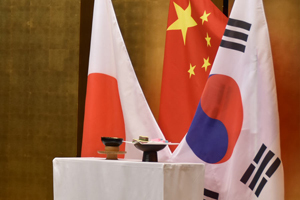 At the opening ceremony, Daisosho first performed a tea offering ceremony on the stage, placing the tea on an offering table set up before the flags of Japan, China, and the ROK, in prayer for peace among these countries and throughout the world. Following that, he and then Vice President WANG Xiuyun of the China-Japan Friendship Association gave welcoming speeches, and there were congratulatory speeches by Vice Minister DONG Wei of the Chinese Ministry of Culture, Ambassador YOKOI Yutaka of the Japanese Embassy in China, and the Head of the Cultural Affairs Department of the Embassy of the ROK in China, HAN Jae-hyok. 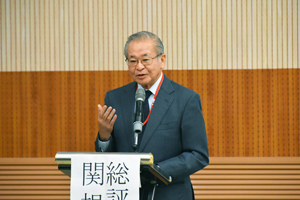 Through the next two hours, the following keynote speakers gave speeches: former U.N. Under-Secretary-General AKASHI Yasushi, whose speech title was "Forty-five years Since the Normalization of Diplomatic Relations: Thinking Back on the Past to Build the Future Together"; Professor FAN Zeng of Peking University, speaking on "Chinese Philosophy and Chado"; and Professor Emeritus KIM Yong Woon of Hanyang University, ROK, whose speech title was "The Korean Peninsula's Denuclearization and Permanent Neutrality." 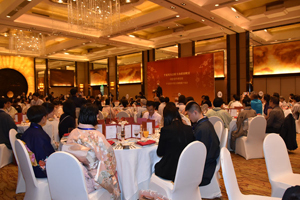 In the evening, all the symposium registrants and participants enjoyed socializing at a banquet hosted by Daisosho at the Shangrila Hotel, located just ten minutes away. 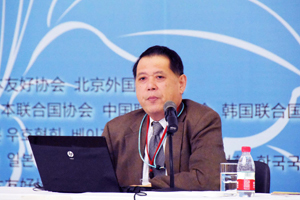 Paper I: "The Development of and Changes in the Tea Ceremony within the Context of East Asia," by ZHANG Jianli (Prof., Chinese Academy of Social Sciences). Discussant, KATO Chihiro (Prof., Doshisha Graduate School of Global Studies, Japan). Paper II: "Chanoyu and the Action Through Inaction Way of Life," by LIM Chan-Soo (Prof., Dept. 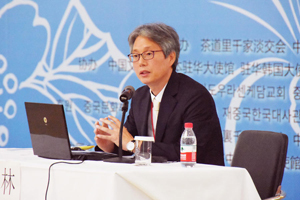 of Asian Culture, Chung-Ang University, ROK). 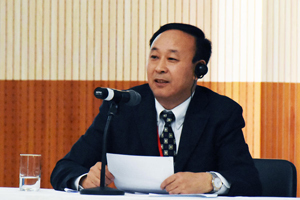 Discussant, SHAO Jianguo (Dean, Japanese Language Dept., BUFS). 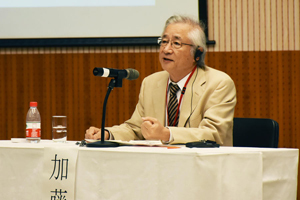 Paper III: "Japan's Way of Tea as a Cultural Exchange Reservoir," by OKAMOTO Koichi (Prof., Faculty of Human Sciences, Toyo Eiwa Jogakuin, Japan). 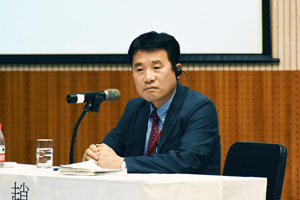 Discussant, CHO Yong-Hun (Lecturer, Konkuk University, ROK, and Chosen Nippo columnist). 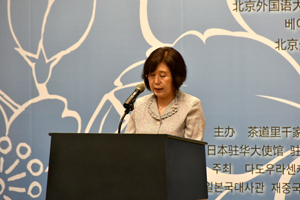 SEKINE Hideji (Director and Prof., Traditional Culture Research Center, Heian Jogakuin St. Agnes' University, Japan) provided the closing comments. YE Jingjing (Doctoral Course, Beijing Center for Japanese Studies), on "The Differences in the Japanese and Chinese Evaluations of the Paintings of Muqi (Jp., Mokkei)." 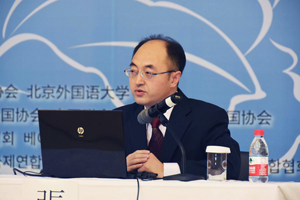 QIE Tingjie (Graduate School of the Chinese Academy of Social Sciences), on "Tea-drinking and Tea-ceremonies in the Monastery Regulations of Master Daikan." IWATA Akiko (Ph.D., Arts) of Japan, on "Chinese Ideas Evident in Chado." 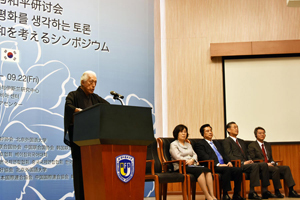 SMUTNEY Yumi (Ph.D., Letters) of Japan, on "The Jesuits' Peaceful Diplomacy Using Chanoyu." CHO Yong-Lan (Ph.D., Letters) of the ROK, on "Tea Culture and the White Porcelain of the Joseon Dynasty." 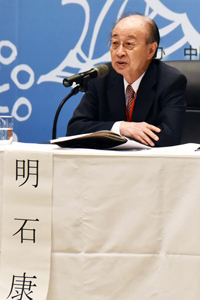 Prof. OKAMOTO Koichi gave a closing commentary, and at the end, there was a period for questions from the audience. 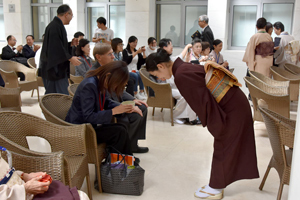 On both days, members of the Urasenke staff in China and of the Urasenke Tankokai Beijing Dokokai worked energetically in providing matcha service to the participants and attendees during the break periods.